B&R quietly released this watch yesterday. I grabbed a screenshot to post here. 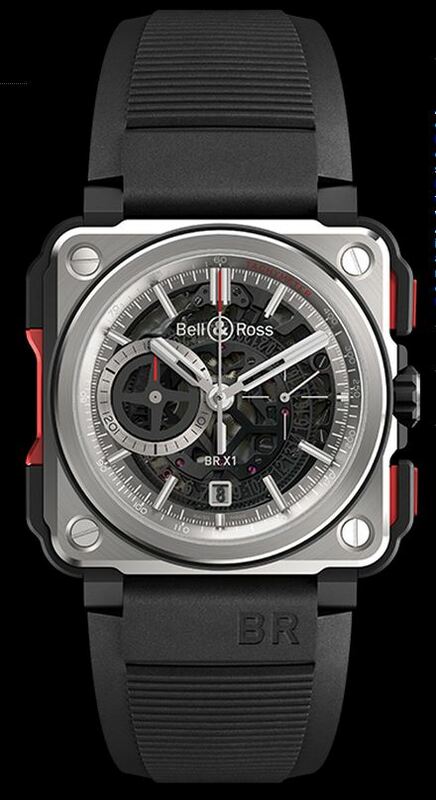 Always ahead of its time, Bell & Ross continues to innovate with the launch of the BR-X1, a high-tech chronograph with a sporty design, which is as robust as it is sophisticated. Revolutionary in its design, the BR-X1 is the first watch of a new collection from Bell & Ross and the beginning of a whole new chapter in the saga of the brand. An extreme version of the BR-01, whose iconic square shape is directly inspired by aeronautical flight instruments, the BR-X1 is much more than a top-of-the-range contemporary sports watch: it is the "Ultimate Utility Watch". Bell & Ross special movement: automatic mechanical. Skeleton chronograph. Functions: hours, minutes and small seconds. Skeleton date at 6 o'clock. Chronograph with 60-second and 30-minute timers. Case: 45 mm diameter. Titanium and ceramic with rubber inserts. Toggle push-buttons. Back with opening in tinted sapphire crystal, centred on the balance. Superluminova®-filled hours and minutes hands. Appliqué metal indices with Superluminova® inserts. This work is a limited edition of 250 pieces.